Serving - 4, makes about 2 cup Rasam. Dilute tamarind paste in water and crush tomato and mix everything together and keep aside. In a blender, coarsely grind cumin seeds, pepper and garlic and keep ready. Heat oil in a kadai, add the tempering ingredients one by one and stir well then add coarsely ground cumin-pepper-garlic and stir well. Then add the tamarind-tomato mixture and add 1 and 1/2 cup water, check salt and sour and add more water if needed. 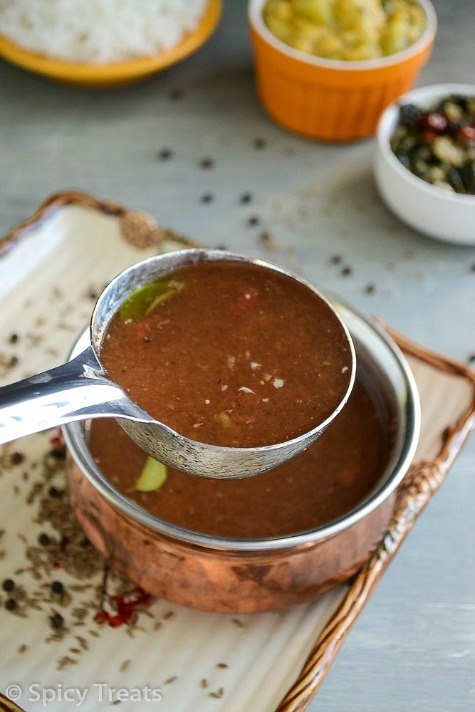 Close the kadai with lid and allow the rasam to boil, once it starts boiling add another 2 tsp freshly ground pepper and simmer for few minutes and switch off the stove. 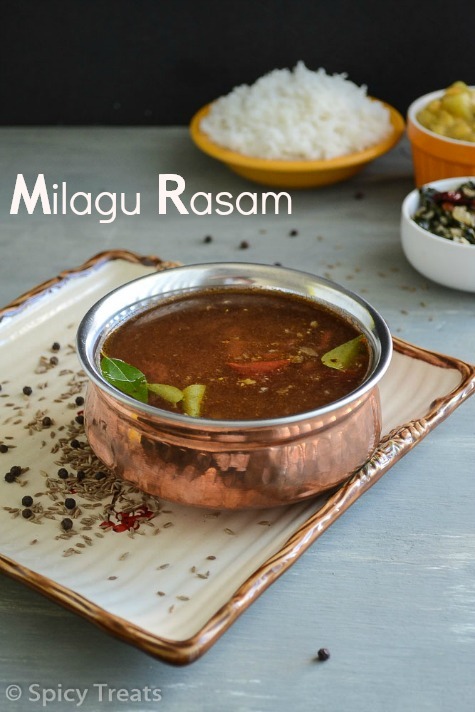 That's it..Flavorful and spicy Pepper Rasam/Milagu Rasam ready. 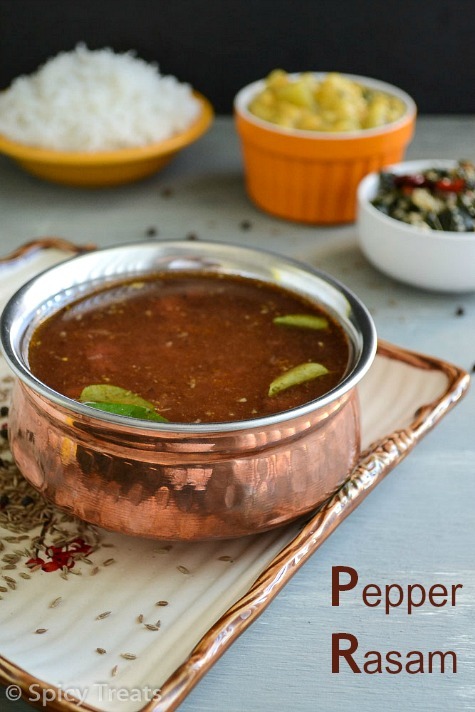 Serve hot with rice or even serve as a soup. We had it along with Chow Chow Kootu, Drumstick leaves Poriyal & Rice for our lunch. Instead of Tamarind paste, you can also use small lemon sized tamarind ball soaked in warm water for 15 minutes, then extract tamarind juice and use it. If using store bought Tamarind paste, use only 1 tbsp or less. 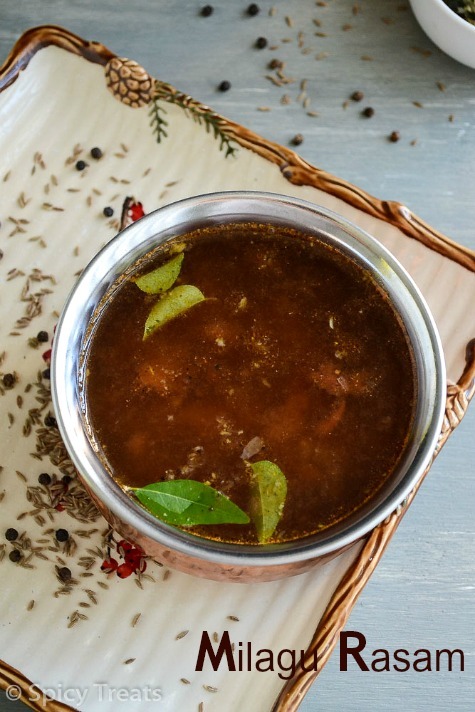 This rasam should be little thin and clear, if you want can add only 1/2 tsp Rasam powder. Wat a comforting food, prefect for this chilled windy season.. I can have this fingerlicking Indian soup anytime. looks so spicy and delicious. nice presentation. exactly after marathon heavy meals this is wat is needed. lovely presentation..